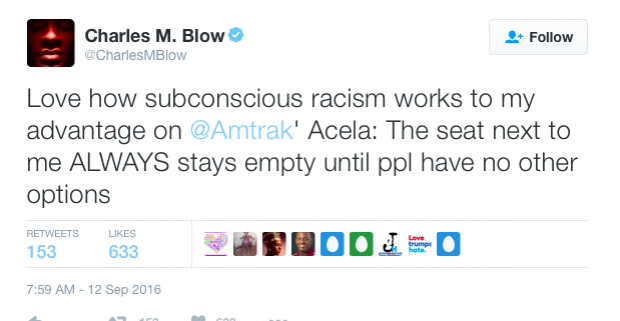 On Monday, the touchy, lefty NYT columnist accused the general public of “subconscious racism” because no one would sit next to him on the pretty pricey Acela. Still another woman wondered if he was man spreading — or, in this case, perhaps that should be labeled blow spreading. But my favorite reaction came from “Mike” who had a more reasoned response. A Washington journalist told The Mirror that Blow is missing the most rational explanation of all. My colleague, phone enthusiast and Washington Gadfly Evan Gahr wrote The Mirror to say he, too, gets discriminated against on the train — maybe because he’s Jewish but more likely because he’s a slob. Others also poked holes in Blow’s racism theory. “Subconscious racism is only one possibility for empty seat next to you. Think hard and I’ll bet you can come up w more,” wrote Steven Murray, a musician and writer. Deplorable Tyreese (a.k.a. @niggatyreese) gave him a talking to. “Laughing at punk @CharlesMBlow, complaining about something he should be grateful for. Stretch out & relax. @Amtrak,” he wrote.